Author’s note: For those of you following the current drought, here are some corn and soybean pictures I snapped yesterday, in Western Tennessee, at the Kentucky border. Thrashing of the wheat, an activity that is one of the subjects of this post, is something I had to ask my mother about. I was not sure when they did this, because we are not seeing much wheat these days. 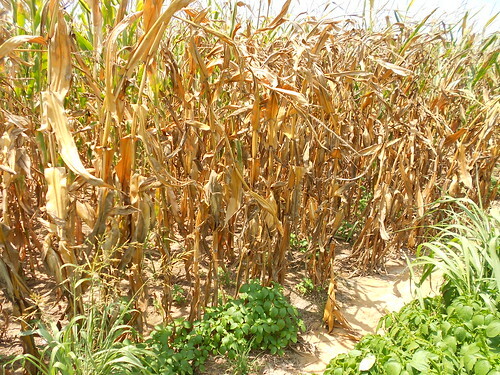 Corn, Drought2012, click to enlarge. Or not. It’s pretty sad. 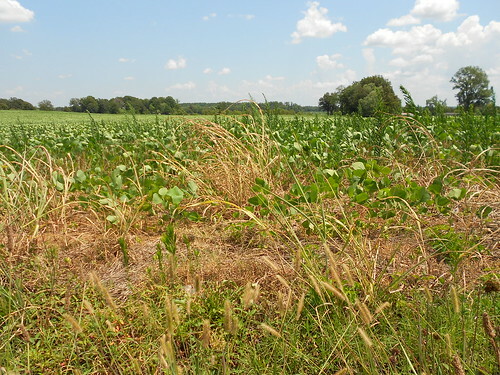 soybeans, Drought2012, click to enlarge. Of all farming activities we performed during the Great Depression of the 1930s, two were notable because they involved the whole community: thrashing of the wheat, and butchering the animals. Summer thrashing of the wheat was the most exciting time of the year because it was a social time rolled into sustenance activity. The thrashing machine, or, in modern spelling, threshing machine (or simply thresher), was a machine first invented by Scottish mechanical engineer Andrew Meikle for use in agriculture. It was invented (c.1784) for the separation of grain from stalks and husks. For thousands of years, grain was separated by hand with flails, and was very laborious and time consuming. Mechanization of this process took much of the drudgery out of farm labour.